When we began homesteading 16 years ago, our loosely articulated goal was “self-sufficiency.” We aimed to grow as much of our own food as possible, with our own hands, our own tools, and our own time. However, when we had children, and subsequently moved onto our own 10 acres of raw land, we re-evaluated this goal. I don’t think it was a conscious decision, but rather one born out of necessity – we landed in a new place, with only a few friends, and a daunting task of creating shelter, water, and food infrastructure. We were in an incredibly vulnerable position that forced us to ask for help (something we are very, very bad at! ), and receive it gracefully. We moved to what I like to refer to as an “intentional neighborhood.” Seven families/communities live within walking distance, and other close friends are a short drive away. 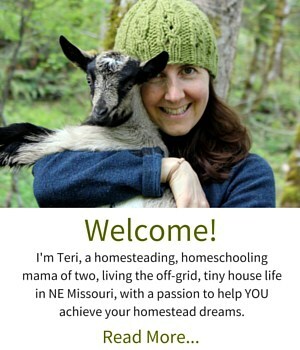 While we each have the desire to remain autonomous about many land-based decisions, there is a degree of inter-connectedness, and a desire to build a strong homesteading community, that is intentional. The prevailing attitude in the community is this: When you are abundant, give. When you are in need, receive. A simple, yet profound concept that has far reaching implications. No one expects you to “return the favor,” rather the gift is given in pure generosity, with the only expectation being that you receive it in the spirit it is given. When my husband was diagnosed with cancer a week after we moved to Missouri, the community gave. Food arrived at our door, friends offered to watch our children, our neighbors gave us a monetary donation to cover the cost of some medical tests. When I badly injured my back two summers ago, our good friend, an acupuncturist, offered low-cost sessions to help me heal. When neighbors face building deadlines, work-parties are called. Our community is not perfect. We have conflict, ups and downs, and miscommunication – sometimes lots of miscommunication! But we continue to ask, “Does self-sufficiency truly serve our needs, or should we be instead striving for community-sufficiency?” I’ll be honest – this is a very challenging notion for me. I’m naturally independent and self-sufficient, and my husband even more so! Our default is to simply do it all ourselves because it often feels easier. There are also many coordinated efforts to source quality food, from participation in a bulk food club, to organizing a raw milk pick up, to creating a local food café. There are also smaller efforts, like selling milk and eggs to neighbors, co-raising animals for meat (such as the pigs we co-raised with our neighbors this summer), and sharing abundant harvests. Work party “teams,” where four families rotate each month helping at one another’s homes. Rotating work parties, on set days, where anyone can request a work party, and the entire community knows to expect a work party every week on Thursdays. An individual homestead has set work party days, for instance, every Wednesday. Our neighbors do quite well with this model, advertising to the local community, university students, and service groups. There are many informal and spontaneous shared meals in this community that values food and connection. There are also periods where it makes sense to schedule shared meals. In the summer months, one family opens their home to a weekly potluck. Every Tuesday night, while the weather permits, anyone is welcome to attend. In the winter months, a smaller group of families often gathers on Friday nights to celebrate and share meals. We also have seasonal gatherings such as a “gross food potluck” for Halloween, and a Thanksgiving feast featuring local, organic, home-grown food. We have shared schooling in a variety of ways. When we first arrived in Missouri, I helped organize a weekly mixed ages Waldorf-inspired kindergarten. 7-13 children attended our Friday morning school, and the parents shared responsibility for snack, circle time, story, and seasonal activities. When our oldest children became First Graders, we shifted our attention to their homeschooling, and one of my neighbors and I (the mama of my daughter’s best friend) decided to share homeschooling. We each teach a four-week block, and then switch. Last year she taught all of the Language Arts blocks, and I taught Math; this year we’re splitting things up a bit more so we can each experience the different subjects. We’ve also had community members offer their service to our children, which is a huge blessing. One community member taught nature classes each week in the middle of winter! The kids bundled up in their snowsuits, went tromping through the woods, and had a great time! Another neighbor taught a natural dyeing class and welcomed the children’s participation. Currently, I’m teaching a month-long musical theater block and staging a kids’ musical! For the most part, each homestead maintains a well-stocked tool shed, simply because we use tools day in and day out. But larger items are often shared, borrowed, or rented. For instance, when we owned a large 4-wheel drive truck, neighbors used it, and contributed .50 cents per mile towards the truck’s upkeep and gas. We have a small hand-built trailer that is occasionally borrowed by neighbors for apple picking. In return, we are traded a large box of apples. This kind of sharing can be casual and organic, or it can be part of a formal agreement or cost-share. When we lived in Oregon, we co-owned a gorgeous cider press with 3 other families. Since we only used the press a few times a year, it made sense to share the investment with others. 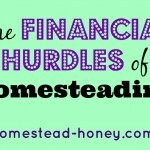 This may be one of the most important components of creating a strong homesteading community! 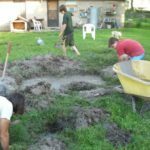 As busy homesteaders, it’s so easy to work, work, work, but creating opportunities for fun is a vital part of building community. I feel fortunate to live near some pretty fun people, as I tend to get sucked into work and can turn overly serious! One of our neighbors has a particular knack for crazy, zany gatherings such as Sled Fest or this year’s favorite, Maze Days (snow was brushed off a frozen pond to create a giant maze. We ice skated around and played a game of tag within the maze. 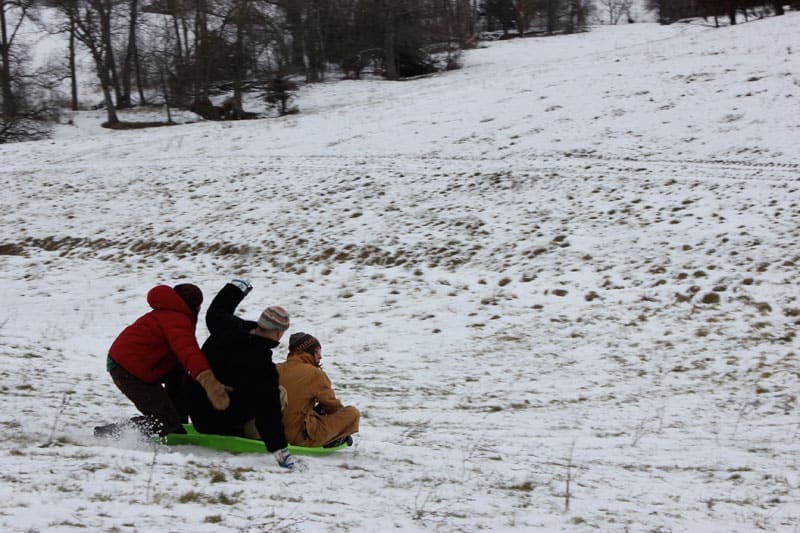 It was great fun for kids and adults!). Some of our neighbors gather for board games, some play soccer on a YMCA league, I really enjoy Craft Night. In the summer months, I love impromptu pond parties. Homesteading is hard work. 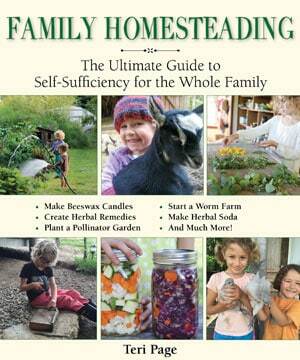 But we can support and strengthen our homesteading community by cultivating interdependence, as best as we’re able. I’d love to hear how others are creating community sufficiency. What has worked for you (or didn’t work)? 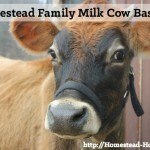 I love the concept of homestead community, although I find it challenging to put into practice. Like you, I easily become too focused on “doing it all” and focused on the work. Especially now, as I am working full-time away from home, there is little time for community building, although we are slowing making connections. I love the strategies you shared – work groups, homeschool sharing, food sharing, all of it really. Before we moved to our land here, we were part of a large Waldorf homeschool cooperative, and I know how well a committed group of families can come together. And of course, the challenges that arise! Thanks for sharing this Teri, it gives me something to consider for the coming months and years. Oh, and I love the changes to your blog site – beautiful! Thanks, Michelle! I am happy with the new blog look. And happy to write about some of these issues, that have long been in my head. I think I wrote the first draft of this blog post over a year ago!! Yes, I absolutely think that starting with the goal of self-sufficiency, one realizes very quickly that it’s just not possible! It’s interesting that you’ve come full circle back to the rural community, and needing to rely on neighbors. All the best! Very good article, food for thought for sure. Beautiful post Teri! Weaving homesteading independence and community interdependence is a challenging task, especially since so many people today grew up without strong community bonds. I imagine that the hard work you are doing in learning about personal boundaries and communication, as well as creating new traditions, will pay off for generations to come. I like to imagine that our children will see these things as second nature, paving he way for a more peaceful future. 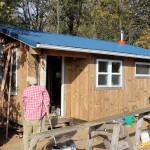 I think it’s the communication and boundaries that are much more difficult than the actual homesteading work! Well, at least a different kind of difficult. But it’s exactly as you say – we didn’t grow up with the notion of community. We had strong family bonds, but rarely shared with our neighbors, and certainly never came together for work parties! I’m still very much in the learning phase! 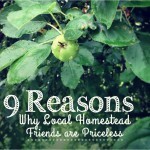 Building a strong community makes perfect sense for homesteaders. The way I see it, the isolated, lonely “self-sufficiency” is more part of a neatly packaged city or suburb existence. 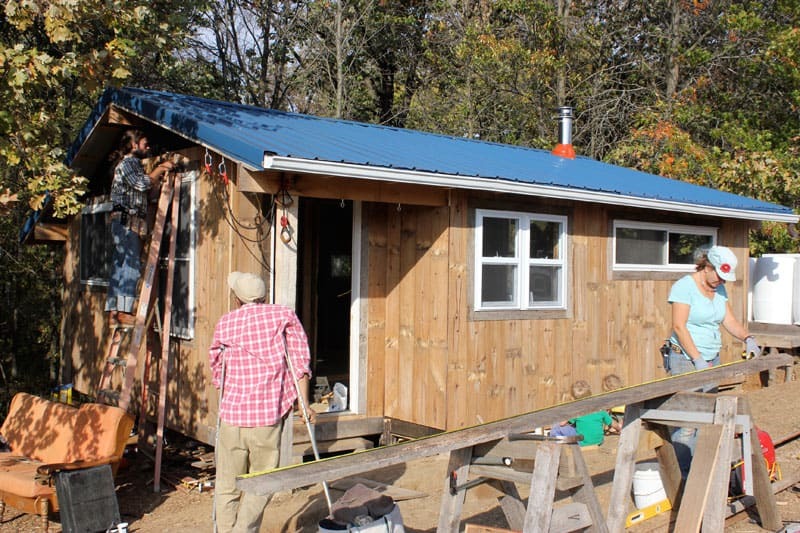 When you move go country and/or move off-grid, it really helps to have extra hands and friendly open houses around – it helps to know there are people you can turn to, to share tools, skills and supplies. Last winter our neighbor trudged through the snow to fix our water-heater, while my husband did emergency weekend computer fixes for people. It really is a necessity! And after publishing that post, wouldn’t you know that we needed a vet to come look at our sick cow. None of the vets within a 30 mile radius were available, but our neighbor came over as soon as we called! We’re very lucky. Excellent article Teri. What you describe is much like my large family and neighbors as I was growing up; I do not know how many homes we built, slabs we poured, barns we repaired, etc, but we were always working on someone’s home or farm when we had time. It seems that you are learning what I learned when I moved out into the woods to build on my dreams and I think it is something learned by the hippies who dropped out there before me too: Independence is an difficult ideal to attain. We use so much infrastructure that has been put in place and maintained by our governments, so many services like telephone and power that have been kept viable by the use of many people – it is a layer of support that we often take for granted. I did all I could, sometimes fabricating things I needed, but towns were always there for me if I needed something. And eventually I had to give in and ask for help because my mind can always create more work than my body can fulfill. Dancing solo can be a joy, but dancing in a group is more rewarding. You certainly grew up with a wonderful experience, and still have it today, I imagine. That is a truly wonderful situation. We all need to build our communities. America has lost that, and working together for a common goal may be how we regain it. I am going to do a better job at it. That sounds like a great common goal! Much better than the division that seems to be the focus these days! Hi Teri! An encouraging article. This is why we want to move there, because of this attitude of interdependence. You all are my heroes in how much you’ve achieved. I hope we can plug into the community though I worry that we are not as strong as we used to be and our bodies are starting to have issues. I also have some hopes that we can go even further with how much all of us can produce within the community, so we don’t have to rely on the wealth pump that brings resources to us in the US from the rest of the world and so that we could inspire others. It’s great to have that energy coming into the community!! I know, I know, I’m horribly late at catching up on your blog, but this has to be one of your best posts yet. Mr. LB & I have had this conversation also. We don’t really need to ‘do it all’ if there is someone else who is doing it how we would anyways. It is actually more efficient: if you have chickens and I have a milk cow, why not each have one chore (and only have to have a set up for one species) and just trade milk and eggs. It’s so reasonable. Also, I love your “attitude” of when abundant / in need. Thank you so much! I really hope to create more of these exchanges this year. We overstretched our animal abilities last year, and this year, I’m looking forward to caring for the ones I love best, and trading with, or buying from my neighbors for the rest! I enjoyed this blog entry. Thank you for sharing this. I have forwarded it to others. 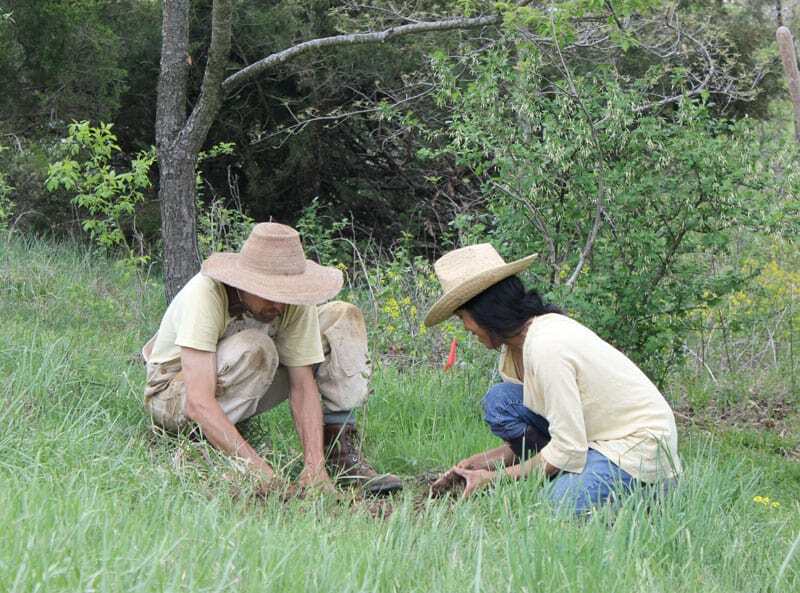 Would you be willing to write about how the land trust you are involved with was set up/works? You may have already done so but I have not seen this on the site. I haven’t really written much about the land trust because it’s still in the formation stage, meaning that we haven’t made any official decisions about how land will be managed, how new members will be brought in, etc. We know that we are going to have a hybrid of co-ownership and private ownership (leasing). We’ve started conversations, but there are lots of details to work out. However, the model that we’ve been following is Red Earth Farms, also in NE Missouri. They have a great website and have included many of their documents for others to read. I’m glad you enjoyed the Sun Oven workshop! It is a really wonderful tool! !